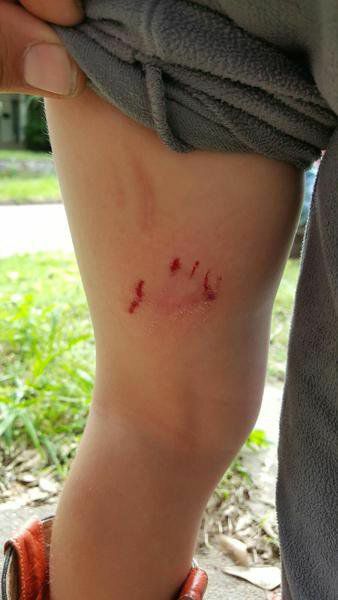 A 5-year-old boy was bitten by a red PIT BULL while the child rode a bicycle outside his McAlester home Friday afternoon. The incident occurred less than a block away from Washington Early Childhood Center and the boy sustained a bite to the upper thigh, the boy’s mother said. The dog is being held in quarantine for 10 days by a local veterinarian. Rocky Eldridge, the father of the boy, said the dog came out from behind a neighbor’s house, and ran across the street before biting his son. Eldridge said his neighbor, Carol Walker, began distracting the dog. But Walker said the dog continued to lunge at her. Both Walker and Eldridge said the dog retreated behind its owner’s house following a whistle the two said they heard. The dog’s owner could not be reached for comment at press time. Eldridge said the family will look into pressing charges, if possible. The boy’s mother, Randall Eldridge, said the family reported the incident to the Pittsburg County Health Department on Monday. Randall Eldridge said the proximity to the school is concerning. Animal Control Officer DeWayne Smith said the process in an incident like this depends on a number of variables. The dog was not up-to-date on vaccinations, so that was step number one. “The dog was not vaccinated and I made the owner take it to a licensed veterinarian,” Smith said. The dog will be quarantined for 10 days to determine if it exhibits signs of rabies, Smith said. The owner can regain control of the dog following the quarantine if the dog is healthy — but the owner could still face charges. “(Owners) can be cited for no rabies vaccination, no tags, and other things,” Smith said. Smith added the owner could face charges if the dog was off the owner’s property. The dog can be classified “vicious” or “at-large” — but Smith said he hadn’t yet been able to follow up with the victim’s family to collect the details of the event. “According to city ordinance, if the dog is on a public sidewalk and not under control it is considered ‘at-large,’” Smith said. Breed is not considered in these cases, Smith said. Smith will take the dog and put it in the pound if the owner is formally charged, he said. A municipal court judge determines if a dog is “vicious” and if it is the dog is ordered to be removed from the city of McAlester. Rocky Eldridge said the family will explore the option of pressing charges.